On Andre Gedalge's Traite de la Fugue book, there are these examples, where before the F note, there is both a natural and a sharp sign, both of which are in different parentheses. Which one do I choose? And why did the author include both of them? Because these are all examples of motion from scale-degree 5 up to scale-degree 1 in the key of C, they seem to be showing that, in choosing a lower neighbor to G, you can have either F or F♯. Since using F♯ in no way alters the local tonality, you are welcome to use either option. One reason why this is important to show is that, since these subjects begin with scale-degree 5, they require tonal answers (not real answers). This lower-neighbor motion from the G will result in the same tonal answer, which (I'm guessing) is one rationale for having the examples presented in this way. In some other fugal circumstances—like if these were countersubjects or some other extra contrapuntal material—you may want to shy away from using F♯ if you want to make it extra clear you're in tonic and not moving to the dominant. This is usually done when a double sharp gets lowered back to a sharp. 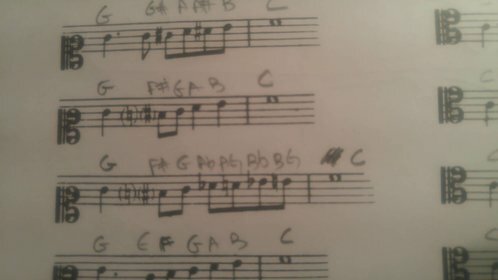 Like for instance, when you are in a# melodic minor and the Leading Tone note gets raised from the G# in the key signature up to a Gx, now when the descending natural minor form is used now this Gx needs to go back to a G#, so one of the forms of notation for this would be a natural sign followed by a sharp sign. You also get the notation where just a single sharp is used, but this is ever so slightly ambiguous. I do prefer the notation with the natural sign. Not the answer you're looking for? Browse other questions tagged theory accidentals or ask your own question. Why does this harmonic minor scale notation use a natural sign?